As I sit here on our back porch, preparing to write this blog, what should be playing over our Sonos system? “Goin’ to the chapel and I’m gonna get married.” How incredibly appropriate! Over Christmas vacation of 1966, Jerry Janc—my boyfriend of five years and fiancé of six months—gave me the green light. “If you can pull a wedding together between now and the end of January, we can get married over semester break” Let’s just say he didn’t see me for the dust, because those were the words I had been waiting to hear. A week or so later, my mother and I visited a long-since departed wedding dress shop on S. Country Club in Tucson. By the time we left that day, I had, as they say, “said yes to the dress.” It was lovely. My mother, Evie, was not thrilled. In her eyes, it had cost a fortune—$130. Considering I was earning $600 a month as a beginning teacher, it was by far the most expensive piece of attire I had ever purchased. And, by the way, I paid for it out of my own pocket. We got married on January 29, 1967. We were poor. We did not have a professional photographer. Friends took color photos with their own cameras. I remember distinctly that one of the ones with me posing in the dress was next to a locker for folding chairs in a church basement. On the wall next to me was a half-sized door with a padlock on it. I remember the photo, but the photo itself, along with many others, disappeared many moons ago in the course of many moves. So if you’re looking at the photo below and thinking that’s me, you have another think coming, as Evie would say. So stay tuned. Two years later, on April 5, 1969, my younger brother, Arlan, married Deidre Dugan. They were as strapped for funds as we were when wedding time came around. Since my brothers tended to marry tall women, I loaned Dee Dee my dress, and it fit her perfectly. But once again, a professional photographer was not in the budget, and the wedding photo they have—one that survived the 26 moves of Arlan’s military career—won’t reproduce here. Sorry. A few years passed, then in 1975, it was time for my youngest brother, Gary, to tie the knot. His wife, Kathy Boyd, was also a tall drink of water, and so it was time to use the dress yet again. 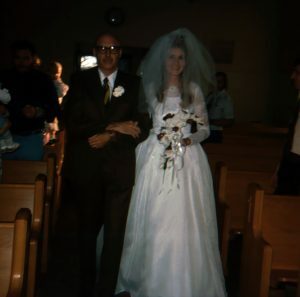 Gary and Kathy actually had a professional photographer present, but the one featured below is also a “friend photo,” was taken on their wedding day, December 25, 1975. Weddings are one thing. Marriages are another. Those of you who have followed this blog know that my first marriage wasn’t the best. That one was only good for thirteen years. For me, love really was lovelier the second time around. Bill and I are at 34 years and counting. Gary and Kathy are coming up on 44. As for Arlan and Dee? Today is their 50th. Happy Anniversary! And Huge Congratulations!! There’s no way we can be in Huntsville, Alabama, for the celebration, but seeing the invitation got me thinking about that much-used dress. Right now the per year cost turns out to be $1.21. I believe even Evie would have to admit that was pretty cost effective.